Free Duracell Multi Strobe Torch and 2 x AA Batteries! 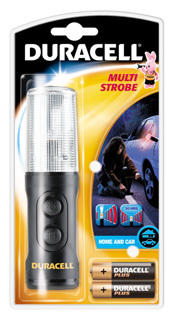 Home > News > Special Offers > Free Duracell Multi Strobe Torch and 2 x AA Batteries! Here at Cell Pack Solutions, we like to give our customers more and right now if you purchase any quantity of Saft 2LSH20 Lithium Gas Fire Ignition Battery Packs from us (yes, any quantity! ), you will receive a free Duracell Multi Strobe Torch! Our thoughts are that if you’ve just purchased a new battery for your gas fire to keep you warm and provide light, we might as well give you a little something to keep light with you on the go! Now, obviously this is only going to be necessary if you are in need of a new gas fire ignition battery, but with the winter months on the horizon we see more and more people ill prepared with backup batteries for their gas fires and these batteries can be in very high demand approaching the winter season. What we suggest you to do is to purchase at least two backup Saft 2LSH20 Lithium Gas Fire Ignition Battery Packs to make sure that you and your family are kept nice and warm this winter guaranteed! Edit: Please note as of 27/04/2012, this offer is now discontinued.